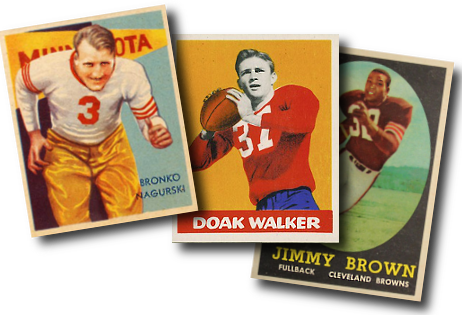 Shop 1950s and older Football Cards Online - Topps, Bowman, and more! National Chicle issued the first real football card set in 1935, but professional football had a modest following at the time and it was not until 1948 that Bowman began issuing a football card set every year. This continued annually, until the Bowman Company was acquired by Topps in 1956, which gave Topps the football card market to itself (with a few minor exceptions) for the next quarter century. Please click on the football card set links below to select your cards. Click here if you want to SELL your old football cards to Dean's Cards.